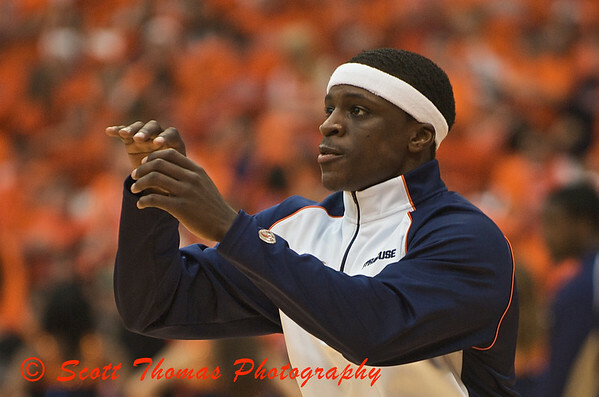 Jonny Flynn warming up before his nationally ranked Syracuse University Orange Men's Basketball team played the Fighting Irish of Notre Dame in a Big East conference game on Saturday, January 17, 2008. SU won the game 93-74 with Jonny Flynn contributing with 17 points and 9 assists. You know when SU’s nationally ranked Men’s basketball team is playing well when Jonny Flynn is going down the court after an SU basket with a huge smile on his face celebrating with his teammates. 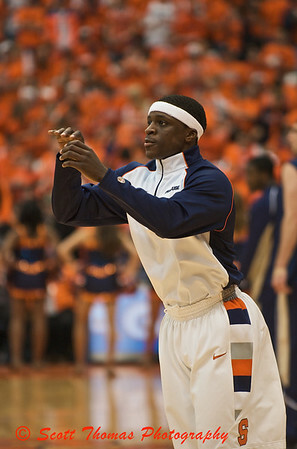 One of the best point guards in college and the Big East conference, Jonny Flynn makes the Orange go. Scoring and distributing the basketball with confidence, grace and a love of the game not always seen these days in big time college sports. It is as much fun to watch him play as he has playing it. Attending the SU-Notre Dame game gave me another opportunity to use the Nikon 70-200mm f/2.8 AF-S VR Zoom Lens and it did not disappoint. Under bright television lights, I was able to use shutter speeds from 1/320 to 1/640 at f/2.8 and ISO ratings from 400 to 800. Last year I barely could muster 1/125 at f/5.6 using an ISO of 1600 when I blogged about Jonny Flynn’s teammate, Paul Harris under the same lighting conditions at the same 200mm focal length. The above photo is a crop from the original vertical composition which I have included here for comparison. This entry was posted in Sports, Weekly View and tagged basketball, carrier dome, college, jonny flynn, orange, Photography, player, syracuse university. Bookmark the permalink. Wow… What a shot. Beautiful. You are absolutely right about the lens you have, it really captures. The cropped top picture is wonderful… Says it all. It almost looks like a hologram. This is a photo I would be so proud of if I had taken it – congratulations – perfection. Nice candid and Perfect cropping…The lens 70-200mm you are using is excellent. Thanks, Yesbuts…I am proud of it. He’s a great player and is having a lot of fun playing at such a high level. Chris, the lens is a dream to use. It’s heavy but I’ve gotten used to it. Its nice when the available light (inside or outside) provides the speeds you need to capture what you desire. Nice job. Blue Skies. This picture is just fantastic in every way! not a basketball fan, but my goodness what a fantastic shot! Both the original composition and the cropped version are simply outstanding. Well done. As a photographer, I’m a pretty fair writer. I won’t presume to comment on the lens . . . but the crop is something else. That’s high-level editing, and a very fine job of it, too. Thanks, everyone. Krmb and Gerry, I’m so happy you like the cropped version. It really shows Jonny Flynn demeanor as he prepared for the game.